Barrel worked with the team at Everleaf, a bittersweet, non-alcoholic aperitif, to launch a new website experience just in time for Dry January. Everleaf is made from a combination of positively sourced plants including saffron, vanilla, and iris. The company was founded by Paul Mathew, a conservation biologist & bartender, in an effort to bring a product to market to encourage sustainable sourcing and consumption. The Everleaf team approached us to design and develop a Shopify website that would tell the unique product and ingredient story in a way that would educate and inspire consumers to seamlessly purchase the beverage. As a nod to the founder’s background in conservation biology, we built upon a design system that utilizes texture and pressed imagery of plants in order to create icons that resemble early cyanotypes — an early photographic printing process of documenting different plants. 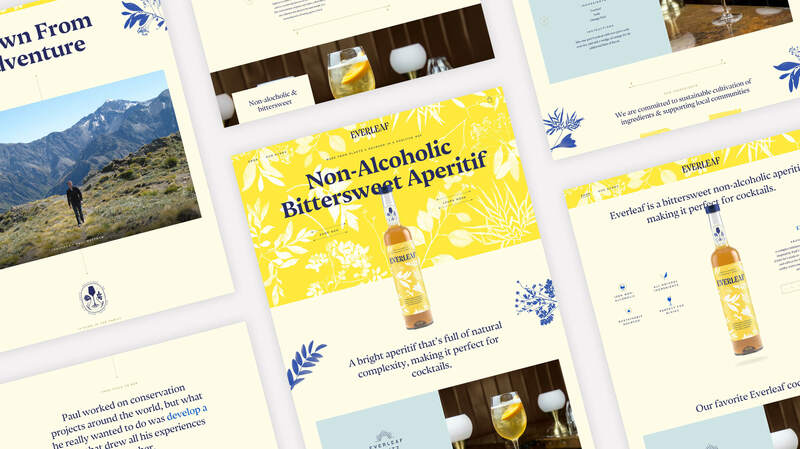 For the past 12 years, Barrel has collaborated with numerous beverage brands to think strategically about their digital experiences including Proper 12, Cambridge Distillery, and Austin Eastciders. Check out the site at everleafdrinks.com.